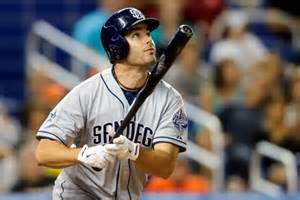 Seth Smith is a 32 year old career journeyman outfielder who spent last year on the San Diego Padres. The current prevailing rumor is that the Seattle Mariners intend to trade promising young pitcher, Joe Maurer for the cagy veteran. The Padres have an abundance of outfielders and are in need of pitching. Seth Smith would be a luxury, and is better used as a trade commodity. Conversely, the Mariners have an abundance of young pitching and need outfielders desperately. What do the Mariners stand to lose? Joe Maurer is 24 with his entire career ahead of him. He was shaky in starts and projects long-term as a reliever, benefiting from his blazing 94 MPH fastball. In relief, Maurer averaged 9.2 strikeouts per nine innings (K/9) and only 1.2 walks per nine innings (BB/9). His numbers were much worse during starts, but could perform in spot start duty occasionally—optimally, he stays in the bullpen. Maurer is the proverbial “fly-ball” pitcher meaning that his skills translate well to the pitcher friendly confines of PetCo Park in San Diego. The Mariners stand to lose an inexpensive and productive reliever, but ultimately replaceable. Ultimately, there are players ready to take Maurer’s place in the minor leagues and in free agency. What do the Mariners stand to gain? Former Athletic, Rockies, and Padres outfielder Seth Smith (and one time backup quarterback for Eli Manning at Ole Miss) is, at worst, a stopgap for the black hole that is the Mariner’s right field. At best, Smith could hold down the right field position as a valuable contributor for 2-3 years. Seth Smith is not, and will not be an all-star; he has been an average defender and above average left-handed batter. Additionally, he has been durable and consistent in his offense. Smith does not hit for power, drive in runs, or steal bases, but he tends to stay away from the long hitting droughts and has averaged a .253 batting average over his career. With the addition of 32 year old Justin Ruggiano from the Cubs, potentially Mariners Manager Lloyd Mclendon can open the Right Field (and potentially Left Field) to competition. Furthermore, the right-handed Ruggiano and left-handed Smith could be considered for a platoon situation which may keep the veterans fresh throughout the season.